When I think of corn pudding I think of Grandma. It’s funny I made this for a birthday party and one of the gentlemen said “OK, whose Grandma made the corn pudding”! I boasted I made the corn pudding Mr. but I am not a Grandma just yet ~ smile! I was given this recipe years ago by my Mother’s best friend Burdette’s daughter in-law Burnetta. How ironic is it that Burdette’s son married a woman named Burnetta, ok I digress. The first time I had the corn pudding was at a cook out. Well you know that dish you taste that’s so freakin good you have to ask or beg if you have to for the recipe, this was it! Then when she gave me the recipe, I thought something this good could not have been this easy to cook. 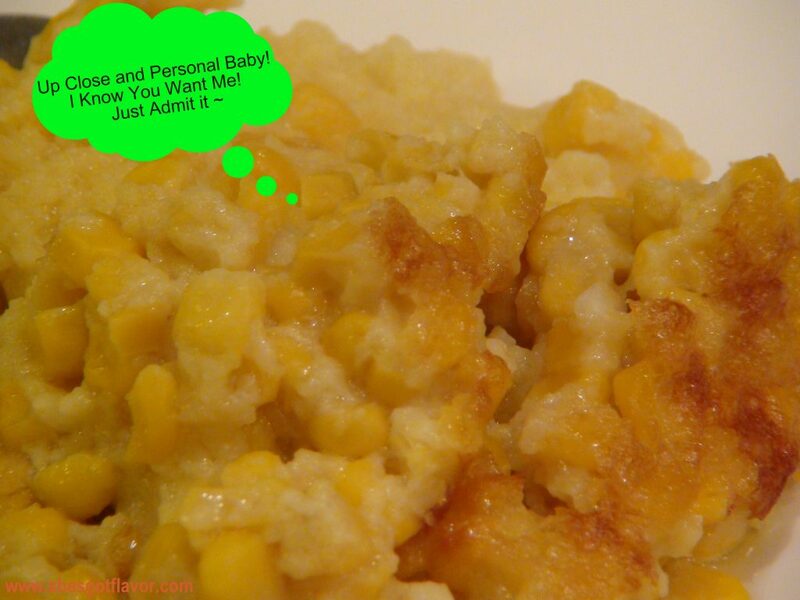 But it was and OMG every time I make this sweet corn pudding it gets rave reviews! Hope you enjoy!!!! Corn pudding is one of my favorites. I haven’t had it with vanilla extract, though. I’ll have to try it. I am starting a recipe-sharing website. Hope you will sign up and share your recipes with us when we launch. I made this and my family loved it!! Also, Sat before last, I made the tomato and cucumber pita pockets. And on that Tues I made the chicken quesadillas and my folks was so happy! 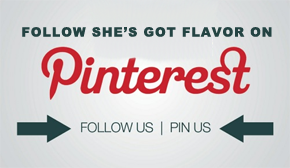 We loved the flavors! I am locked to your recipes now! Thanks! 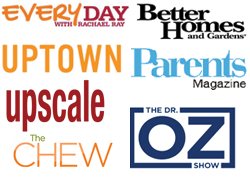 Hi Beverly – Yes you do! Enjoy!! Hi there!! It is quite interesting how different cultures create food using similar concepts and ingredients. Thank you for sharing! Come back often! Thanks for the recipe. I will be baking this this weekend for our Sunday dinner. I missed when you put in the vanilla extract, I’ll add it in the order listed. can this made ahead and frozen? If I am doubling the recipe, do I double the cooking time as well? If you use a longer pan and it spreads out no … but if the pan is deeper then add another 30 minutes … but watch it … it should be firm but still jiggle and slight brown on top . I’m baking this right now! Thanks Utokia and Happy Thanksgiving! I’ve been making corn pudding for years everyone has loved it, but I would fight every year with it separating because of the butter…I’m assumingnow that I didn’t add enough eggs and flour. I just made the recipe as you have it and I have to say that it is AMAZING. Acually the best I’ve ever had. I do add a little cinnamon to mine. I cannot wait for everyone to taste it at our Thanksgiving day dinner today. THANK YOU so much for sharing. I see you added Pure Vanilla Extract but on your video you didn’t add any. Where does it come in? OMG OMG OMG….. 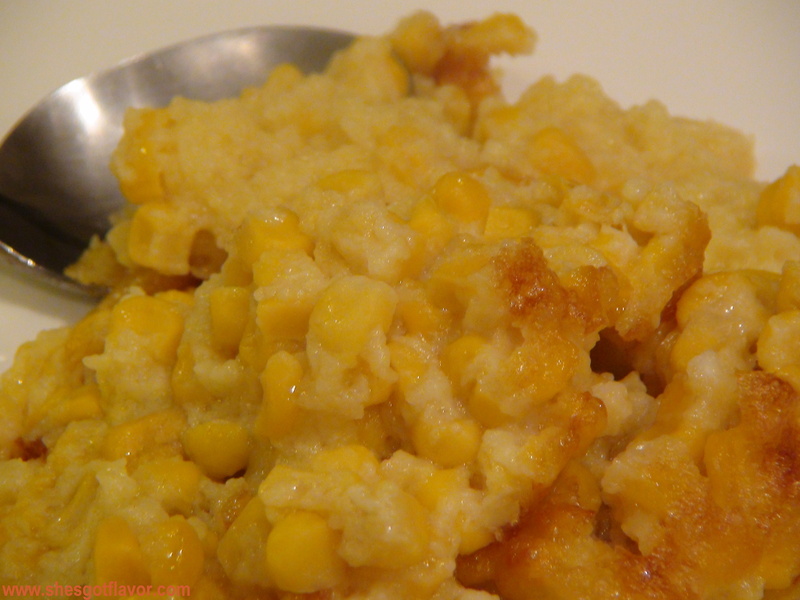 THIS CORN PUDDING IS OUT OF THISE WORLD DELICIOUS. I MADE IT TODAY FOR THANKSGIVING DINNER AND FOLLOWED UTOPIA’S DIRECTION IN THE VIDEO STEP BY STEP CAREFULLY, AND IT CAME OUT BEAUTIFUL. IT WAS A HIT WITH MY FAMILY. THEY COULDNT STOP TALKING ABOUT IT. OUT OF ALL MY OF MY DISHES FROM DINNER, THE CORNPUDDING PAN WAS LEFT EMPTY….THANK YOU UTOPIA, GIRL YOU ARE AWSOME. I DID ADD SOME CINNAMON AND NUTMEG….AGAIN DELICIOUS. Utopia do you have a recipe for old fashion bread pudding with the lemon sauce just like grandma make? If you are supposed to drain the corn you might want to add that in the recipe. If I didn’t look at the comments I would have poured the liquid in with the corn. If I am doing a small portion do I split all of the ingredients that you listed in half? I’ve heard people add jiffy cornbread mix to theirs…have you heard that recipe? I have been making this once a month since christmas and its so good. I have two very picky toddlers and they just love it. I am making it again tomorrow for Easter and I am going to try to add club crackers on top. Thanks for a great recipe and have a great Easter! Hello I make this all of the time and is a side dish for all of my holiday meals and my very picky eaters just LOVE IT! 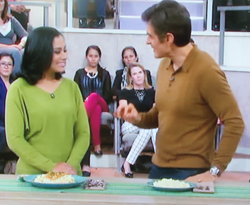 I am having my thanksgiving today and my question is can I bake it in a foil pan? I wanna make sure it wont burn if I cook it in one…thanks! Awww Victoria I am so happy to hear, this recipe is one that is close to my heart because it was adapted from a recipe from my Mom’s best friend’s daughter. It is always a hit and so easy to make. Hope you visit us again for some other yummy recipes. In the beginning, you said the ingredients had to be added in the order given and that you’d explain why, but you never did. If it all gets mixed together, what difference does it make in what order they are added to the bowl? I think this recipe sounds and looks fabulous. I can’t wait to make this! Also, you’re very, very pretty. You are seen pouring the mixture in to an OVAL dish, but the one you take out at the end is in a square, so what happened to the one you created and put into the oven to begin with? Did something happend to it, perhaps it did not turn out right? Do we need to adjust the recipe? What size baking dish do you use? I like for that to be included in a new recipe because it does affect cooking time. This dish looks DIVINE! I see others have posed this question, but not yet received a response. What size baking pan did you use? Knowing the proper pan dimensions is critical to obtaining the recipe’s ideal texture. Thanks in advance! Happy thanksgiving to you and yours. No problem! I truly appreciate your response! You’ll be happy to know that I made this for Thanksgiving and it was a HUGE hit! Everyone asked me for your recipe. that is so awesome Lisa! can you substitute corn bread mix instead of flour? I looked at your video and want to use it for Thanksgiving.So where does the vanilla come in because i didn’t see that part either ? Also what size baking dish ? Can’t wait to try it.and Thanks for the recipe. I stumbled up on this recipe because my neighbor mentioned just the other day that she wanted some corn pudding. When I read through the list of recipes, I thought, I’m not sure on this, I’m not sure of that and then I came upon yours. I read it and it spoke to my soul…so I have to try it. It will be a surprise to my neighbor when I make it and I believe we both will laugh while I share with her how she got to have the pleasure of tasting your recipe. I will let you know how it turned out. THANKS A MILLION…WILL KEEP YOU POSTED. 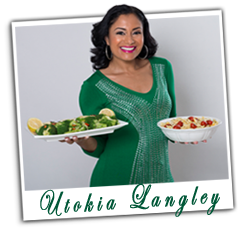 Utokia, what size baking dish do you use? My mother was known for her corn pudding. When she passed away several years ago no one had the recipe. Try as we could, we couldn’t come close. I found your recipe and it was a hit. It’s as close to my mothers that I’ve tasted. Thank you very much!! Hi, I love this recipe with add cinnamon and nutmeg. The problem is I can’t find the dish you used. I checked Pyrex store, it was sold out, same at Wal-Mart etc. So the first time I used a lasagna pan and it turned hard a bit dry but everyone still loved it. Second time I used a 9 x 13 nonstick pan and it had to be baked longer. I’m planning in making it tomorrow again and I’m gonna use a 9 x 13 pyrex dish. Hope it turns out Ok. Could you post what dish and size you used? What brand? Hi, I have been looking for this recipe for a long time. My girlfriend gave it to me but I lost it. I know this is this is the same one and it is a favorite in my family, thanks so much I won’t ever loose this. Has anyone tried making this in a crockpot? Hi Paula, no I have not tried this in the crockpot. I like the baking method because it gels well. I’m excited about making this. I MISS the fabulous southern corn pudding my best friend- Sally used to make. It’s very close to her recipe minus the vanilla. The recipe didn’t have the serving size and checked the comments with no mention. My guess maybe 6 servings, please advise how many servings? Thanks. Von yes yes yes this corn pudding taste like somebody’s grandma made it! Oh no this can easily service 8-10… WELL that is if everyone has one serving (smile), but good luck with that! My crew is normally going back for seconds. One of my favorite dishes at holiday time. I grew up on it and I could never replicate what my aunties made when I was a child. They always said that I should add one egg for each small can of evaporated milk. I was shocked that when I found this recipe, it contained zero milk. It is sweet, creamy and custard…which is my favorite!! This one is a definite hit! I brought this to a company holiday potluck last year and I had elder coworkers asking me for the recipe. Hello Kinya, aww this comment just melts my heart, I’m so happy you enjoyed it and you are able to share with others. Thank you for visiting and come back for more recipes soon. Hi! I’m making this for Thanksgiving. Can I make it the night before unbaked and refrigerate it? Hi Nikki, hope I caught you in time, I was running around last minute Thanksgiving shopping … but YES you can definitely prep it the night before BUT save the melted butter for right before you put it in the oven … pour the melted butter in, stir it and bake but all other stuff do the night before … funny I am doing the same thing tonight … hope your Thanksgiving is AWESOME!! Yay! Thank you so much for the quick response! Making two batches tonight. My son’s preschool class made this recipe for the “Thanksgiving Feast” and my husband and I loved it! Bringing it to two celebrations tomorrow 😊 Happy Thanksgiving to you! I was wondering how many serving does this recipe make? How many eggs will I need for this recipe i am feeding 15 people? How much milk as well and flour and all? 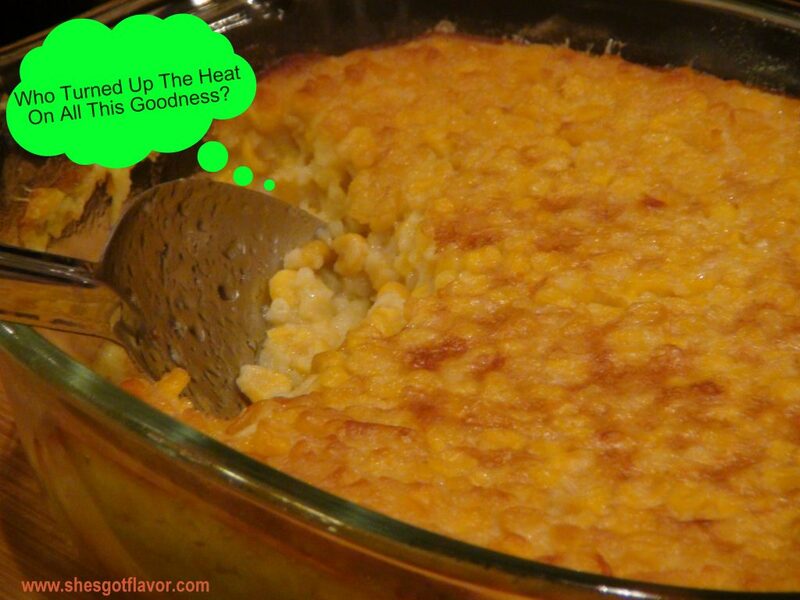 Can you bake corn pudding in a foil pan ? 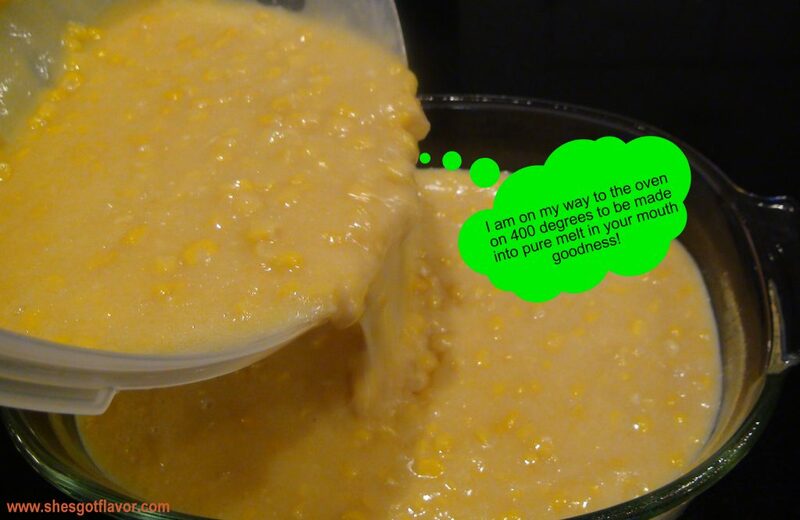 I have made corn pudding many different ways I’ve checked out different blogs for the last 3 weeks; googled how to make corn pudding with canned corn since I missed the summer corn crop, and came across your recipe. I’v already purchased whipping cream, halfnhalf when I noticed your recipe mentioned none. So I was intrigued and now as I am prepping my dish for dinner, I think I found a new way to make this dish! I am planning on making your corn pudding for Thanksgiving this year (3 days from now). I watched your video, but couldn’t tell the capacity of the baking dish we should use. It looks s smaller than a 9″ x 13″ and the first dish (when you added and stirred all the ingredients) was round, but the finished corn pudding (after baking an hour) was in a rectangular dish. Just curious as to the size dish to use for baking??? Thanks! Looks delicious and I can’t wait to try it! Any size pan will work, the texture and taste will be the same. Has anyone cooked this at 350 degrees instead of 400? I’m planning a 9×13 pan, but wondering how long the cooking time will be at 350? Hi! I made the corn pudding for Christmas and we loved it! Thanks for uploading a video and providing step-by step instructions. I think this will be a staple for holidays and get-togethers from now on! Happy Holidays to everyone reading this! Hello! Very late to the table here! Want to make this for Thanksgiving. What size baking dish did you use?